Yesterday, a Super Hornet crashed on takeoff from the USS Theodore Roosevelt , a UH-1Y went missing during disaster relief operations in Nepal, a Cobra made an emergency landing in the LA River canal and the NAS Corpus Christi flight line was inundated with water. It was a rough Tuesday for America’s air forces. The massive quake that hit Nepal has resulted in a widespread humanitarian response, including a hodgepodge of helicopters and air transports from around the world that are operating in uncertain and challenging conditions. A reminder of the risk posed to crews working in what in some cases are more dangerous conditions than the found in a war zone reared its head yesterday as a USMC UH-1Y with six Marines and two Nepalese citizens on-board went missing. The helicopter, which belonged to Marine Light Attack Helicopter Squadron 469 out of Camp Pendleton, California, was working as part of a larger detachment of American Ospreys and other helicopters trying to bring relief and assist in search and rescue operations in the region. There has been no emergency beacon signals and no signs of a crash yet as assets scramble to search for the helicopter and its passengers. An Osprey was on the scene shortly after the UH-1Y went missing, although it was only able to search for about 90 minutes before it had to return to base. Making matters worse, a powerful 7.3 magnitude aftershock hit the region on Tuesday as well, spreading air support assets even thinner than they were already. If the aircraft went down relatively intact, the high mountainous terrain could impair radio transmissions from its crew, so there still are hopes that the crew will be found alive. Nepal’s mountain military teams are attempting to move into the area on foot and USMC forces, which continue to build in the region, launched at dawn to assist with the search for their missing comrades. As of now there are rumors that there may have been a radio call about a fuel system issue, although a definitive answer as to whether the call came from the UH-1Y or another helicopter operating in the area remains elusive. Thousands of miles east from Nepal, a F/A-18F Super Hornet belonging to VFA-211 “Checkmates” crashed into the Persian Gulf right after launching from the USS Theodore Roosevelt. Both crew ejected and were rescued in good condition thankfully. The aircraft is a total loss and it is unclear if it will be recovered from the seafloor or not. Many thousands more miles east from the Persian Gulf, a strong weather system swept through southern Texas, packing heavy rains that flooded NAS Corpus Christi. 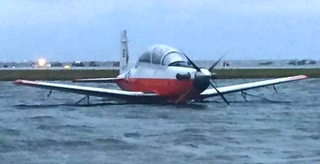 The waters pushed right up to the fuselages of T-34C Turbo Mentors and T-6 Texan IIs training aircraft parked there. Once the waters recede, dozens of aircraft will be checked for damage to their landing gear, lower fuselages and electronics before operations resume. It would be hard to imagine that such a catastrophic looking event would not result in substantial damage to aircraft and the base’s infrastructure. Finally, close to 1500 miles east of Corpus Christi, a AH-1W Cobra made an emergency landing in the LA River near South Gate after having an in flight emergency. Nobody was hurt and the aircraft landed safely, although it must have been amazing sight to see the attack chopper disappear below the channel’s rim. The aircraft and crew waited for a repair team from Camp Pendleton to take a look at the Cobra. It ended up just being a faulty gauge and the helicopter and its crew successfully flew home about five hours after the landing.